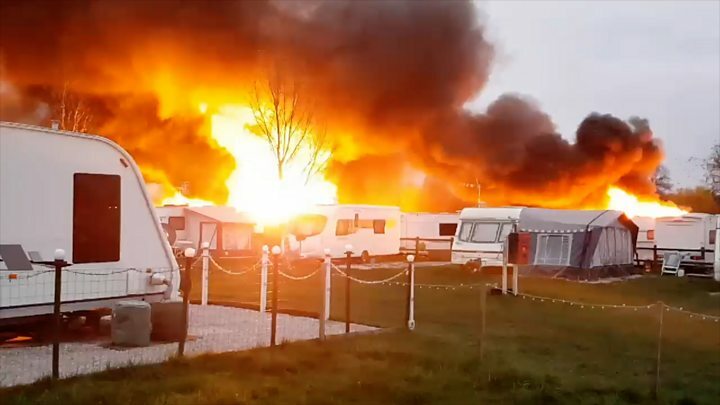 Forty caravans have been destroyed and another 40 damaged by the heat in a huge blaze at a caravan park. Firefighters were called to the storage yard at Ainmoor Grange Caravan Park in Stretton, Derbyshire, at 05:30 GMT. When they arrived, they were faced with "a significant developed fire". No-one was injured. Caravan owner Michael Cheetham said he was "devastated" he had lost items in the fire which reminded him of his dead brother. John Cook, from Derbyshire Fire and Rescue Service, said crews "had made an aggressive attack on the fire" and "created a fire break". "By doing that we managed to contain the area to the place of origin and reduce significant damage to the whole campsite," he said. The fire was out by about 09:00 and Mr Cook said crews would carry out an investigation into the cause. There are about 500 caravans - both static and touring - on the site. Retired engineer Mr Cheetham, 65, had stored his caravan at the site for the past 18 years. He said it was "definitely" destroyed in the blaze. Mr Cheetham and his brother Paul, who died in November, used to use the caravan when they went to classic car shows together. Items left inside the caravan which reminded Mr Cheetham of his brother included his walking stick and mug. Mr Cheetham said: "I'm devastated, I saw a video of them blowing up - mine's definitely gone. I feel particularly sorry for the owners, they're wonderful people." He added his caravan had been worth about £2,500 but some lost vehicles worth £30,000.